Urban infill is defined as "new development that is sited on vacant or undeveloped land within an existing community, and that is enclosed by other types of development." Benefits include supporting populations required to attract certain amenities (parks, community services, retail), and increasing the supply of affordable housing. During the course of design we placed great emphasis on contextual design, that the development fit the scale and character of the surrounding neighborhood. Another essential design component was protecting and designing in response to the historically significant bungalow fronting the site at River Street. Project Team responsible for design production included S&N Associates Planning & Design (Daniel Silvernail Architect, Inc. in partnership with Dennis Norton Designs), Bowman & Williams Civil Engineers, Pacific Crest Geotechnical, project archeologist Robert Carrier, arborist Maureen Hamb, and landscape architect Mike Arnone & Associates. 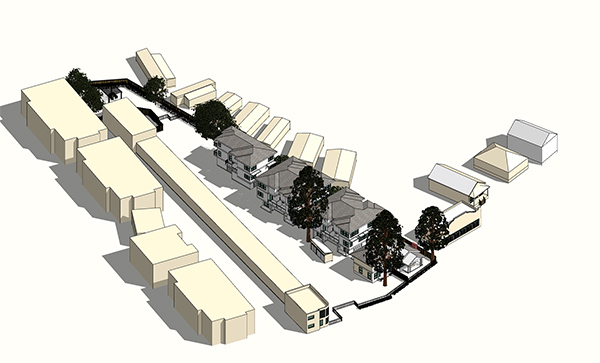 River Street Townhomes has obtained Design Permit and Planned Development Permit approvals from Santa Cruz City Council, where it received high marks for its aesthetic content, protection of historic buildings and significant trees extant at the site, sensitivity to the needs of neighboring residents, and harmonious design response to the surrounding architectural context.